‘History (is) a text demanding to be read,’ says Niall Lucy, Curtin Professor of Critical Theory, in the introduction to his remarkable collaboration with poet John Kinsella, The Ballad of Moondyne Joe. ‘But we are not historians, and this is not a history book.’ As with its putative subject, the convict outlaw Moondyne Joe, it’s hard to say in a short review what this book, in fact, is: a mixture of history, poetry, criticism, political analysis, memoir and literary esprit, it’s a work that consciously resists closure and definition. Moondyne Joe – or Joseph Bolitho Johns, as he was known to the penal system – is a figure akin to Ned Kelly, an outlaw who captured the popular imagination. He worked as a miner in Cornwall and Wales before he was arrested in 1848 and sentenced to 10 years’ penal labour for stealing ‘three loaves of bread, one piece of bacon, several cheeses, and other goods’. He spent time in the newly designed Benthamite Pentonville Prison before he was moved to one of the notoriously overcrowded and disease-ridden prison hulks. In 1852 he was transported to Western Australia. When Johns arrived in Australia he was awarded a ticket of leave for good behaviour, and moved to the remote Avon Valley. His nickname came from the Aboriginal name for that region. His career as Western Australia’s premier escapologist began in 1864, when he was convicted of killing and eating a neighbour’s ox. He protested his innocence all his life, and it was after that, perhaps stung by the injustice of his punishment, that he began the series of prison escapes that made his reputation. The most famous was his ingenious escape in 1867 from Fremantle Prison, where a cell was built especially to house him by the unpopular and corrupt Governor John Hampton. One of the models for Randolph Stow’s children’s classic Captain Midnite, Moondyne Joe’s story inspired many other retellings: a swashbuckling popular novel, Moondyne: An Australian Tale, by Irish Republican and transported Fenian John Boyle O’Reilly, a film, several histories, plays, popular ballads and songs, and a tourist industry. Kinsella and Lucy add their own layerings of personal memoir, imagined narrative and critique. The book opens with a chronology, ‘Timeline: an essay’, which maps many of the preoccupations that inform the later writings. It begins with Joseph Johns’s birth, sometime around 1826 – as with so much of his story, the records are doubtful – and ends in 2012 with the publication of The Ballad of Moondyne Joe, ‘a work of the imagination informed by conversations on history, literature, philosophy and AC/DC’. This book is full of surprises: a pitch-perfect parody of The Love Song of J. Alfred Prufrock as rendered by Moondyne Joe made me laugh out loud. None of the individual works is ascribed to either author, and although it’s sometimes obvious – Kinsella’s poems, for instance, are instantly recognisable and show off his considerable gift for ventriloquism – it is clear that this book is born of two different minds bent on the same project, to the point where they become a third thing, the collaboration itself. 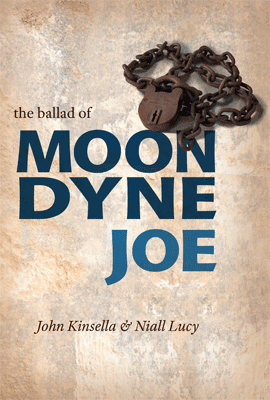 The Ballad of Moondyne Joe is lusciously designed and produced, and is notable as a work of scholarly research. The reproduced documents include newspaper articles, legal documents, nineteenth-century photographs and landscape paintings and the script of the 1913 feature film Moondyne (the film is now lost, although the script was submitted to the Patents Office and thus preserved). But it presents itself explicitly as a literary work. There’s a sense of free-ranging imaginative and intellectual engagement that at first I questioned, but that by the end creates its own justification. Moondyne Joe is more than the sometimes ambiguous documentary evidence of his life, more than the stories that grew around him, more than anecdote and rumour, more than symbol, more than representation. In the course of chasing his meanings, Kinsella and Lucy produce a text that considers English colonisation in Australia, Ireland and America, the treatment of Indigenous people under colonial rule, and the development of the penal system (via Foucault), including the imprisonment of the mentally ill, sick and poor. There’s a fascinating literary analysis of John Boyce O’Reilly’s literary works, considerations of AC/DC’s Bon Scott, a radio play, and a collection of poems. It’s an excessive book, in which the accumulation and juxtaposition of text produces excess meaning, each subsequent exploration refracting what has already been read and enriching it. The book’s considerable achievement is that this excess is allowed to remain unresolved, so all the various tellings and retellings remain in suspension in the reader’s mind. This, a tribute to how skilfully the book is structured, makes it very hard to know where to begin writing about it. And it is also true to the tact at the centre of this collaboration, which seeks to avoid pinning a singular meaning on either Moondyne Joe or Joseph Johns. It always respects his talent for escape. Moondyne is not a mythology. Moondyne is not a nationalist sell-in. Even on the level of local, he evades capture. Moondyne Joe is myth. Joseph Bolitho Johns is fact. Moondyne Joe is the word. Joseph Bolitho Johns never was. In the course of the book, these distinctions and contradictions become at once more blurred and more clear. On the one hand, the fracture between the increasingly abject historical figure and the stories inspired by Moondyne Joe becomes starkly evident. On the other, the slipperiness of historical fact – itself a question of textual analysis and subject to error and re-evaluation – is highlighted. For instance, the date of Joseph John’s death has been disputed: he most likely died in Fremantle Lunatic Asylum in 1900, but there is also a story that a man claiming to be Moondyne Joe died in an old people’s home in 1920, which made its way into the history. 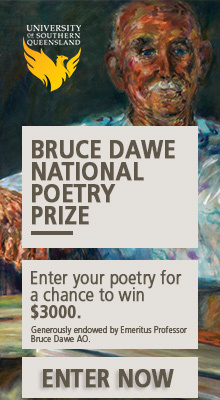 As an exploration of the implications of this idea, The Ballad of Moondyne Joe is exemplary. It seems an act as much as a text, which makes it poetic at its core: you have to read it to experience its thesis at work, as it activates you as a reader. And it’s one of those books that becomes the more fascinating the further you read on. Highly recommended. Thank-you Alison. I had heard from other sources that this book by John and Niall was ‘something’ special. That it made it’s own genre (a nice oxymoronic use of a term that perhaps does what it says despite logical contradiction of itself)! Your ‘review’ does what every publisher (and author?) wants … makes me want to go and get it straight-away. And as you have provided this service (back in 2013) without any feedback thus far, it felt only fair to say ‘Job well-done!’ Thanks.